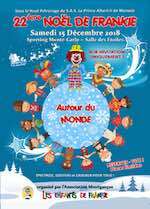 By invitation only, the Noel de Frankie Christmas party is free for sick and disadvantaged children in the PACA region. This year's theme is Autour du Monde. Members of the public can buy tickets for the Kids Nite gala on 14 Dec. Organized by the Enfants de Frankie. For more information phone +377 93 30 08 00, email frankie[at]monaco.mc and visit the website at: Les Enfants de Frankie.